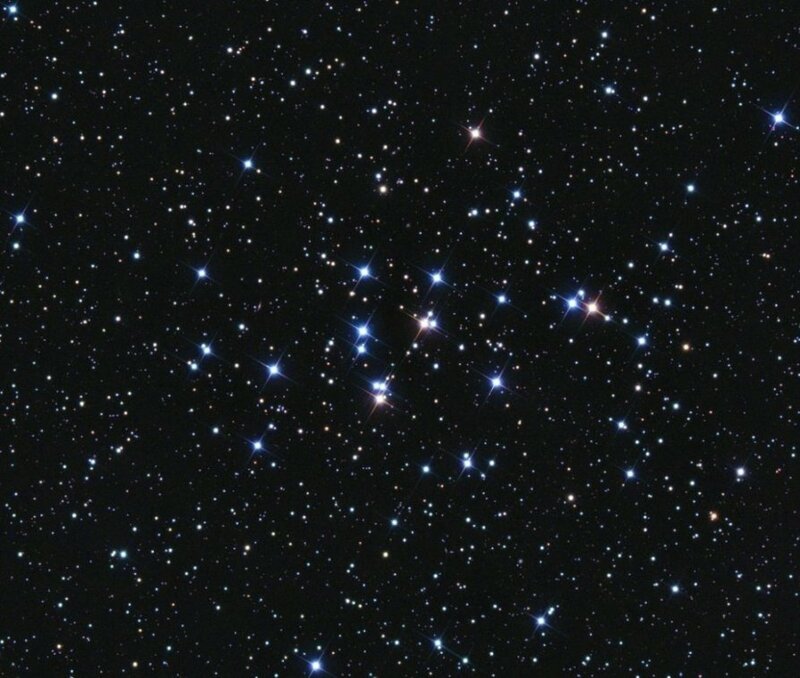 The constellation Cancer is quite well placed during March, and Cancer contains a couple of very nice open clusters that make excellent imaging objects, namely M44 the Beehive cluster or Praesepe or NGC2632, and M67 [NGC2682] which doesn’t seem to have a “popular” name. For the March imaging object of the month I shall choose M44 which lies at a distance of 515 light years. I prefer imaging clusters because the whole data set can be easily acquired in one evening’s imaging session, whereas nebulae typically require several evening’s work with the Sky 90/M25C combination. M44 is quite large with a diameter in excess of one-degree, so you need a reasonably wide field set up in order to capture the whole object. Being a fairly bright cluster [magnitude 5.1] the subs don’t need to be too long, and in the image below I used 400-seconds with the IDAS LP filter in place. The total exposure time was just three hours, easily achieved in a single evening. 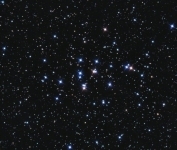 The image is a cropped version as it better enhances the cluster by creating a more appropriate “window”. I particularly like the contrast between the bright blue and red/orange stars in M44, the colours contrast very well just as in the double star Albireo in Cygnus. Not much to say in terms of imaging technique with this one other than go for as long a total exposure time as possible for a nice smooth image, and make sure your tracking is spot on for nice round stars. This entry was posted in IOM, Sky 90 and SXVF-M25C and tagged Sky 90, SXVF-M25C. Bookmark the permalink.